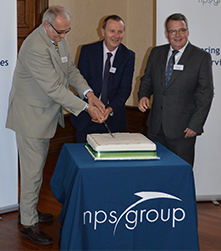 The Leader, Councillors, Chief Executive, senior City Council Officers and other invited guests joined NPS staff to mark the beginning of this ten-year, £1.6m a year agreement and look ahead to how the new company will work with the Council and other local clients. The company - which began trading on 8 July 2016 - has already been busy on a number of council led and partnership schemes including school expansion and other council infrastructure projects. “With the exciting project at Fletton Quays, where the Council is driving forward with its partners the redevelopment and regeneration of this area of the city, we are already working to design the new agile working environment of the Council’s offices, alongside the housing and commercial facilities that are all part of this transformational scheme,” Paul added. Sixteen staff positions from Peterborough City Council’s Estates and Strategic Assets department have transferred into the new company under Transfer Undertakings Protection of Employment (TUPE) regulations. Councillor David Seaton, cabinet member for resources for Peterborough City Council, said: "Our new partnership with NPS will give us better access to high quality property specialists at short notice and in addition will make the council and our residents money by the joint venture trading its services to other organisations. "Long term we want to be the property consultant of choice across the region and recognised for delivering an outstanding service. "We are well on our way to becoming a commissioning council and this latest joint venture is a further example of how we are providing our residents with the best possible services in the most cost effective way, whilst generating income." This latest Joint Venture is the 11th that NPS Group operates with local authorities around the country.